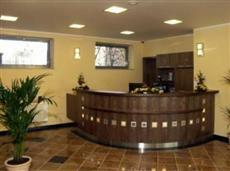 Location: the hotel is situated in Prague 9, a twenty minute ride on public transport from the city centre. Accommodations: 68 double rooms with the possibility of an extra bed; one room for handicapped guests. The rooms are furnished with a WC, shower, a direct line telephone, and a television. Restaurant: a pleasant restaurant with an original interior and typical Czech cuisine. The restaurant seats 80. Wi-Fi connections are free of charge. Services: souvenir sales, internet, telephone, and fax connections to the entire world, currency exchange office, cultural event service and transfers throughout the entire Czech Republic, safety deposit for valuables, cleaning and ironing. Parking: parking is available for guests at the hotel.